The Stars Are Ours : One by Mari Arden Cover Reveal! 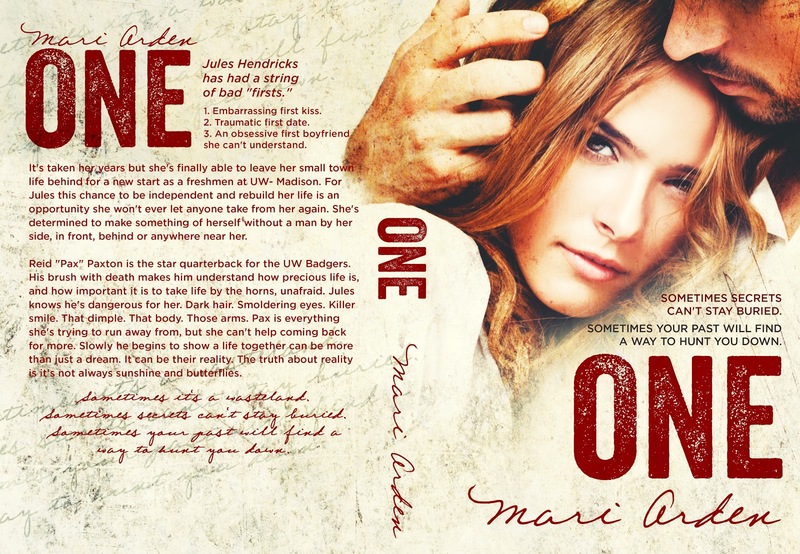 Here is the BEAUTIFUL full wrap for Mari Arden's ONE! This cover was done by the amazing Regina at Mae I Design! Jules Hendricks has had a string of bad "firsts." Embarrassing first kiss. Traumatic first date. An obsessive first boyfriend she can't understand. It's taken her years but she's finally able to leave her small town life behind for a new start as a freshmen at UW- Madison. For Jules this chance to be independent and rebuild her life is an opportunity she won't ever let anyone take from her again. She's determined to make something of herself without a man by her side, in front, behind or anywhere near her. Reid "Pax" Paxton is the star quarterback for the UW Badgers. His brush with death makes him understand how precious life is, and how important it is to take life by the horns, unafraid. Jules knows he's dangerous for her. Dark hair. Smoldering eyes. Killer smile. That dimple. That body. Those arms. Pax is everything she's trying to run away from, but she can't help coming back for more. Slowly he begins to show a life together can be more than just a dream. It can be their reality. The truth about reality is it's not always sunshine and butterflies. Sometimes secrets can't stay buried. Sometimes your past will find a way to hunt you down. **Warning: the contents of this book are intended for readers 18+ and older due to explicit adult situations. "Do I make you nervous?" His husky drawl drips like chocolate covering a ripe, round strawberry. Does he make me nervous? Does a simmering volcano make an ant nervous? I swallow. "Nervous? I'm not nervous," I babble, refusing to look at him. I'm in physical pain. What's that thing I do where I take in air, and then let it out? Oh yeah, breathing. I need to do that. I make a strangled sound and inhale through my nostrils, taking in the smoky air like a ravenous puppy finding milk. Instantly I feel Pax's heat next to me. Soon I'll be immersed in it, wrapped in it. So does that make me nervous? Only a hundred kinds of nervous. "Time to begin!" Cade yells, as he jogs back to Pax and I, flashing his pearly whites. He pounds Pax on the back. "Don't drop the ball," he grins. "As if I ever do." Cade turns to me. I see the second he registers my cleavage is exposed to the world. His eyes appraise me slowly. He gives me an appreciative grin. "Well, hello there." "Hi," I reply. "Um, should we start now?" I don't mean to be rude, but I'm a second away from vomiting every cell inside me, and call me crazy, but I'd prefer not to start off my year known as the Vomiter. "Yes," Pax glares at Cade. "Let's start." He inserts himself between us, blocking Cade's view of me. His firm, half naked body is next to my face. Pax's musky cologne combined with a sweaty scent unique to him assails my nostrils until my senses are reeling out of control. Cade chuckles, looking amused. I want to glare at him. I don't find anything amusing about this. "Ready when you are." Pax turns to me, his emerald eyes dark pools in the sunlight. This close I see every glorious inch of him, from the tiny stubbles of black hair covering the lower part of his face to the rippling six pack decorating his stomach like a tattoo. I don't dare look any lower. My pulse skitters. I forget to breathe. Something hard and hot unfurls in my belly. Unable to tear my gaze from him I watch helpless as his mouth drifts closer, until he' so close his breath mingles with mine. I'm Mari Arden (Mari rhymes with safari). Teacher by day, author by night. When I'm not living my double life I like to hike and try foods from all over the world. Up until recently, I used to be scared of dogs. Even puppies. True story. Now I'm just afraid of anything with more than six legs. I write to soothe my soul and to, hopefully, entertain YOU. Adventurous? Come join my double life!